Detail of "American Elm, Eastern Parkway, Brooklyn 2012"
Mitch Epstein (A'74) is exhibiting a new body of work at Sikkema Jenkins in New York through April 14th. 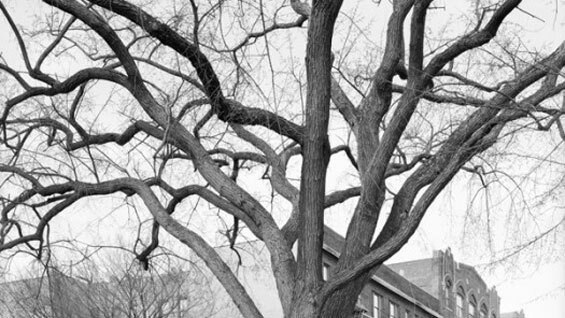 "Mitch Epstein’s new work features the idiosyncratic trees that populate New York City, underscoring the importance of trees in urban life and their complex relationship with the city’s human dwellers. … Epstein began this yearlong project in search of designated Great Trees, as deemed by the Parks Department in 1985. Finding these trees was less important to Epstein than the pursuit of them, which led him to discover and photograph numerous unofficial 'great' trees with remarkable qualities of their own." Epstein is also interviewed on the Architectural League of New York's Urban Omnibus blog, where he discusses his work and its beginnings at The Cooper Union.